Rising from the three day 4th African Sanitation and Hygiene Conference tagged “AfricaSan4″ African leaders have issued the “Ngor Declaration on Sanitation and Hygiene” which aims to achieve universal access to adequate and sustainable sanitation, safe hygiene services and eliminate open defecation by 2030. They also reaffirmed their commitment to the human right to water and sanitation for all for all Africans, and pledged to work towards progressively eliminating inequalities that currently deny about 547m people in Africa access to safe sanitation. Another major highlight of the declaration is a commitment by countries to fund sanitation and hygiene budget to a minimum of 0.5% of GDP by 2020. The triennial AfricaSan organised by the African MinistersCouncil on Water (AMCOW) aims to address Africa’s sanitation challenge including helping agencies and governments shape strategies for action at many levels. Mainly attended by sanitation technical experts, it provides a forum to to exchange lessons, to identify approaches and technologies that work best in their local circumstances. This 4th AfricaSan water held in Dakar, Senegal, this week. Achieve universal access to adequate and sustainable sanitation and hygiene services and eliminate open defecation by 2030. Mobilise support and resources at the highest political level for sanitation and hygiene to disproportionately prioritize sanitation and hygiene in national development plans. Enable continued active engagement with AMCOW’s AfricaSan process. Development banks, donors and partners to increase their support to government led efforts for universal access to sanitation and hygiene and to match this financial support with responsible accountable engagement. My encounter on the road to Karim Village wasn’t a palatable experience for me, the Village had just been ravaged by the deadly flood that swept across the country, bad roads, fear of transportation on water coupled with visible angry flooded villagers. At last I landed in ‘Snake Island’. Karim Village, headquarters of Karim- Lamido Local Government in Taraba state, North East Nigeria. It takes about seven hours by road from Jalingo the state capital, due to bad roads and the vastness of the land, but I took less than 3hours taking waterways using local boat from River Lau, to River Benue to Jen and motorcycle to Karim town. Thou the people of karim Lamido are still battling the effects of flood that ravaged the rustic community, Typhoid and other water related diseases remains another nightmare. Karim village known among visitors mostly Corps Members (a Nigeria government youth scheme for fresh graduates) as Snake Inland due to heavy presence of reptiles. The town is surrounded by water and thick grasses, which makes snakes a common sight , about four different tribes (Karim jo , Jenjo, Bachama, Bambur) made up of the undeveloped Agrarian land with people majorly dealing in rice farming and fishing as source of livelihood. Faced with lack of safe water despite surrounded by River Benue and Lau River, lack of toilets, the people of Karim despite their many problems, has its own uniqueness of peace and harmony among its more than 195,844(2006 census) Christians and Muslims who co-exist peacefully. Water related disease affects the young and the old in Karim because of their nomadic nature, they tend to move from place to place in search of greener pastures for their immediate family, leaving behind available water source . Major sources of water include rivers, ponds, and open wells which the inhabitants use for their domestic activities and every other water related activity. However little or no assistance is available on the issue of healthcare, the community is armed with an unequipped primary health care center to abate the water crisis facing the community. According to, the Principal Community Health Officer(PCHO) of only Primary Health Centre, Karim Dr. Isa Nayin , typhoid and other gastro intestinal diseases like dysentery and diarrhea are prevalent in the locality. He said that these diseases is commonly reported from remote areas which includes Karim- Mondi, Ruwan Fulani, Kwanchi and Mutum Daya, the villages about two hours motorcycle ride from the center. Sighting the disease of the F’s (Faeces-Flies-Food-Finger) as the major vector of the disease, Dr Isa stressed that these diseases occur because there is no reliable source of water within the locality. Another problem facing the community is ‘Color change in water’ mostly especially in the rural areas where different activities take place within the village ponds or rivers, pigs are allowed to go play in drinking ponds thereby causing a dramatic change in the color of water changing to red. 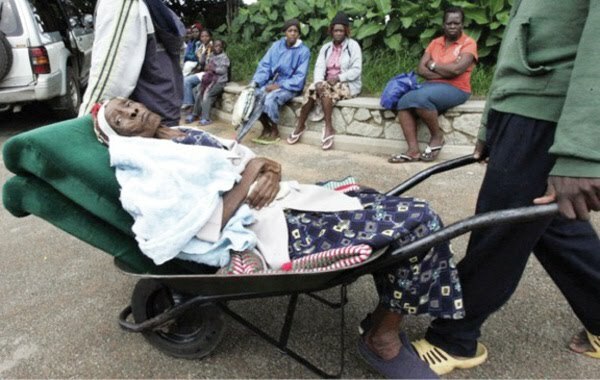 While a health worker Bumanda Andrew express fear considering the increasing casualties of water related diseases appealed to both local and state Government authorities to come to the aid of the community residents. Commenting on the water problem, Government official, the vice- chairman of Karim Lamido Local Government, Alhaji Ahmad Umar Karim admitted that Government is aware of the peoples plights but assures that efforts are made to reduce their hardship. The people of Karim are still hopeless on safe water, basic healthcare among other social amenities, where will respite come their way? 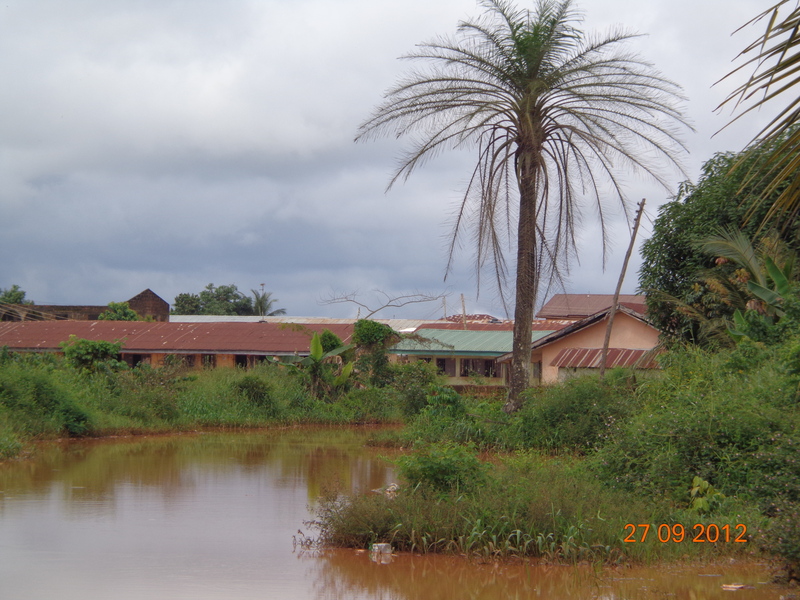 Ikola-ilumo community in Agbado /Oke Odo Local Council Development Area of Lagos State is among the rural communities springing up in the suburb of Nigeria’s commercial nerve centre. Inhabited mainly by low income people and artisans, residents in the community however face the obvious challenges experienced by new and growing communities in the country. Plastered bungalows and other uncompleted buildings are prominent in the community which is home to people who have found cheaper accommodation in the peri urban settlement. With the recent establishment of a Local Government Primary School and a borehole facility, there seems to be a little signal of government’s presence. 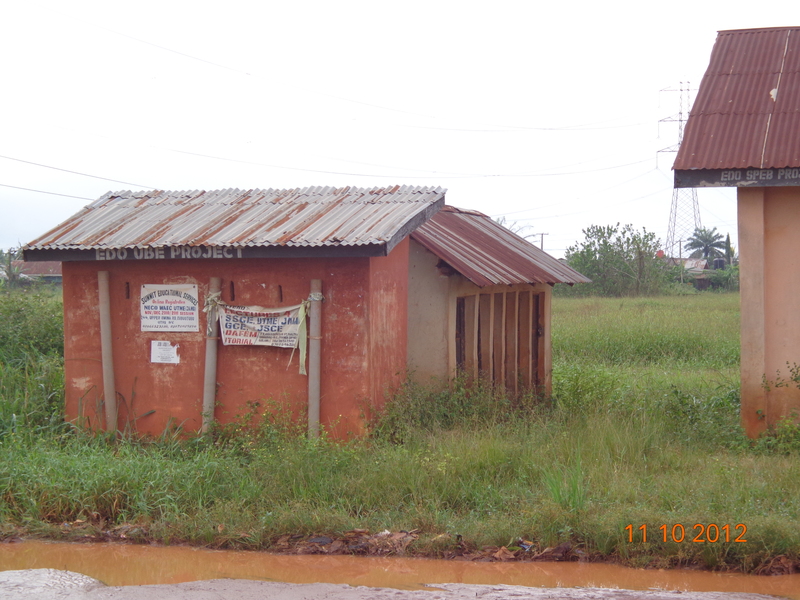 Though without a single tarred road, a public clinic, the community can only ask for more. The erratic power supply makes it difficult for the few residents who operate personal boreholes to pump water regularly. A community leader and one of the executives of the Community Development Association, Elder Emmanuel Okoko confirmed the erratic power supply in the neighbourhood. “We have power supply here just about three days in a week. It is now worse than what we used to have perhaps due to more people moving in”, he said. Okoko who retired from Lufthansa, German airlines after about 40 years of service settled in Ikola-Ilumo around 1999. “When I came here, people queried me why I decided to settle in the bush, today, this place is opening up, at lease the population is about 250,000. The government should come to the aid of the teeming population”, he urged. Cost of assessing water supply in the community is a source of concern to the growing population. 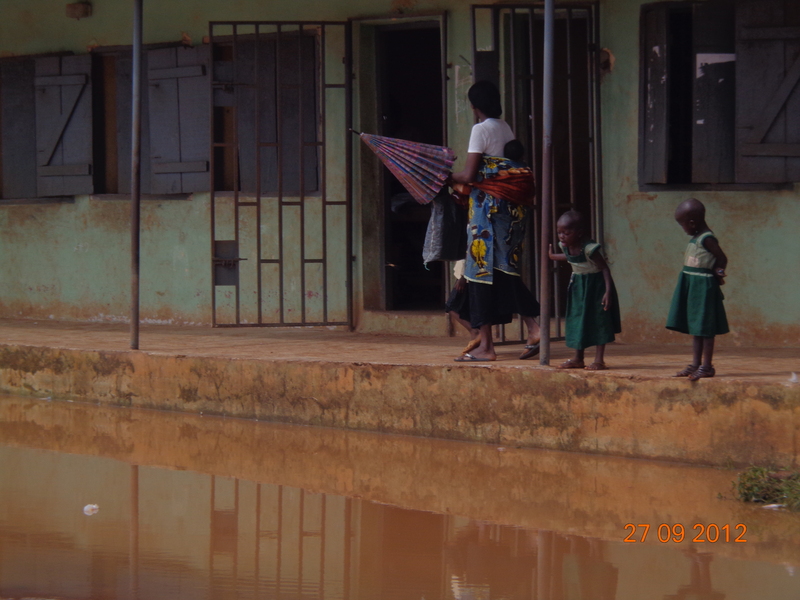 Mrs. Joan Emmanuel is a School Proprietress in Ikola-Ilumo laments the difficulties in assessing clean water which is causing sanitation problems for the teeming population. “I am the Proprietress of Bright Horizon Schools in Peace Estate, Ilola-Ilumo and interacting with the parents here I found that water supply and sanitation is a major challenge”, said Emmanuel who noted that most people in the neighbourhood are low income earners and artisans whose take home remuneration cannot sustain rent in developed settlements outside the area. She however identified poverty as a major problem of the people causing them to compromise clean water which is as important as life itself. Most residents in the community are low income people earners who cannot afford to sink bore holes within their premises and have to rely on the community borehole and streams. “For instance in my family of five, we spend N350 on a drum of water every day which amounts to about N10,000 a month, most people in the neighbourhood cannot afford that and this explains why people go for alternatives which are not too safe. If you come here early in the morning you will see people searching for water in nearby wells which is not safe enough for drinking”, said Emmanuel continuing that “with family income of about N800, 000 annually, spending N350 per day on water translates to about 15% of our income, I insist that most people in the community are not that comfortable”. “There is a borehole provided by the Local Government somewhere in the community which provides water for houses close to it. It is a good initiative but one borehole is just not enough to serve the large population because like I said, we are about 250,000 people here”, he noted. “We do not have borehole, but we have a well from which we fetch water needed for our sanitation. As a female student, water is essential and the well water is what we have access to in the absence of pipe borne water from the government”, she said, adding that “we buy sachet water during break for drinking or we bring water from home because the well water is not safe for drinking”. Ihuoma Okoko, a Chemist in the community also confirms the difficulty involved in getting clean water in the area said: “Like you can see, this community is neglected and water is difficult to get. Those who compromise clean water must spend more in buying drugs, so I feel it is easier to spend more on water than to spend the money on drugs with associated pains”, adding that “the cost of water here in Ikola-Ilumo is more than what obtains in neighbouring Ipaja or Gowon Estate where there are tarred roads good enough for water tankers and sachet water trucks, the government should please come to our aid in this community to ensure safe water because apart from the cost of good water, our health is also at stake”. The Medical Director who coordinates medical missions in rural communities where access to safe drinking water is a challenge, continued “I have handled several health cases which are direct products of lack of access to clean water, we have had to administer between 30 to 40 drips in treating someone who contracted water borne disease due to lack of access to clean water and the cost implication can only be imagined”. Though the cost of treating water related ailments varies from place to place, Omonaiye urged rural dwellers to ensure good hygiene and safe water intake. He also laments the absence of pipe borne water in rural communities and even areas inhabited by the so called middle class people. Sharing his experiences, the Medical Doctor said “there are lots of avoidable illnesses suffered by people in the rural areas just because of lack of access to clean sources of water. For instance during our trip to Olomometa beach, an off shore community near Badagry, Lagos, we found the prevalence of ailments Such as Cholera, diarrhea, cold, and catarrh simply due lack of clean water and cold winds from the sea. Iju-Aga a semi urban community located between Lagos and Ogun States on the outskirts of Lagos is perhaps the closest settlement to the popular Iju Water works, which is the biggest water plant in Lagos State. Ironically, most homes in the community do not take their daily water supply from the plant. Alhaji Tijani a community leader and prominent Landlord in the area who has said. “When I built my house here in the 1980s, I bought 11 long pipes to connect water from the main road. Then the pressure of the water was much and it was regular”. But oday most homes in the community hosting the water works do not take water from the plant and this should not be so. The story is however different in many homes who are not so buoyant to sink private bore holes. Tomi Olaoluwa is a resident who grew up in the neighbourhood. Speaking about water supply in the area, Tomi said “early in the morning residents mostly women and children would go out to seek for water from commercial bore holes where they pay before fetching”. “This area may seem to be close to the water works serving major parts of highbrow Lagos area but we are not even familiar with their service as commercial water vendors have found a lucrative business”, she said, pointing to two water selling points in the area. However, water vendors in the neighbourhood supply water to homes :“Each jerry cancosts N20”, said Hamza, one of the water vendors in the neighbourhood. Iju water plant was built in 1901 to produce a capacity of 11,000 m3/d for colonial quarters in Ikoyi/Obalende areas through a normal 28’’ diameter (700mm) iron trunk “A” water pipe. Meanwhile, as the needs increased, another expansion was made in 1943 when the capacity of the water plant was raised to 27,000m3/d as accompanied by the laying of another cast iron trunk “B” pipe of 24’’ (600mm). Charity, they say begins from home, many have continued to wonder why the community hosting the mega water corporation has not been a direct beneficiary of the service it renders to other far away communities in Lagos. Hassan Bamidele, Chair, WASH Media Network in Zamfara state, Northern Nigeria examines the status of water supply, sanitation, and hygiene in the state. 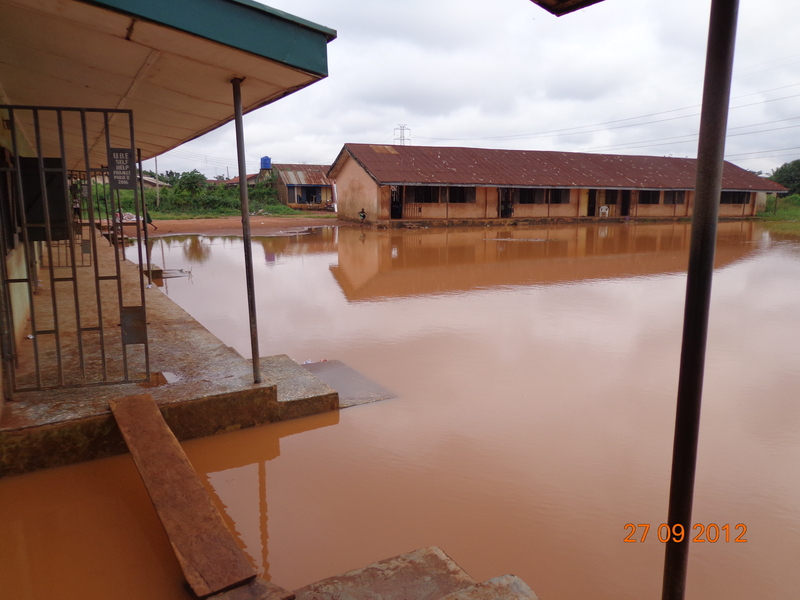 A fallout of the recent flood that ravaged major Zamfara villages is likely outbreak of an epidemic . 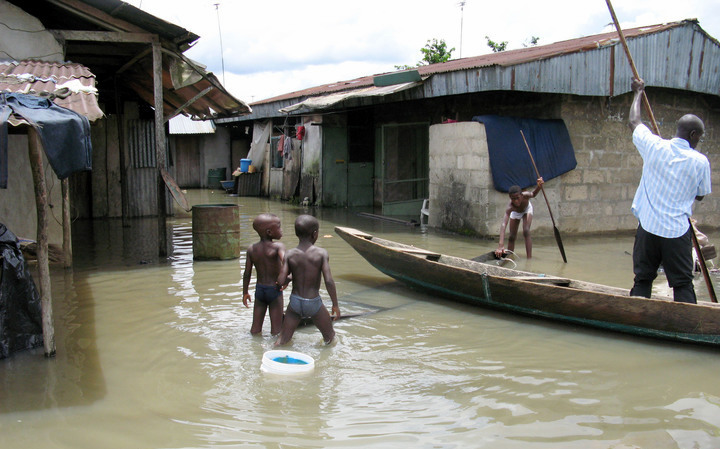 In Dangulbi village, for instance where buildings were heavily submerged by water Public health is highly endangered among residents as the water sources are heavily polluted, and there is increase incidences of water borne diseases among little children. The WASH situation in Kambarawa and other villages of Kaura-Namoda Local Government of Zamfara State Is highly appaling. Water is several wells in the villages are polluted and contaminated necessitating being declared unsafe for use. Dump sites have contaminated underground water making them toxic, yet people still fetch this water for domestic use. Villages dig holes to fetch water that comes out brownish in colour,filterate and Use the residue domestically. A group of nine villages including Lambar-Kurya, has no good toilet facilities for their public schools Resulting in feacal residues swimmings back to the available streams where residents source drinking water. At Kasuwar Daji Bridge, residents indiscriminately dump garbage just any where and contaminates the ponds, wells, streams that harbors little water for their daily consumption. Many communities in these villages have sad tales to tell as they search for water all most every day. Yearly, diarrhea, dysentary and other acute respiration infections are responsive for the deaths of children in the above listed/visited villages as a result of their poor source of drinking water, poor sanitary conditions and filty environment. In most of the schools, zinc built kitchens are always close to the few public toilets available in the schools. – Poor hygiene practices-Most of the kitchen staff’s are with their children whereas these children defecate anywhere and pour sand on top to cover it up close to the kitchen premises. – Majority of the students defecated at the back of the few available toilets in the bushy parts close to the kitchen because these few toilets have poor facilities and they feared that they may contact diseases when they use them. In Government Girls Secondary School, Samaru, Gusau, Zamfara State, the hand dug well provides water for the school kitchen is not well covered and situated close to the School incinerator where refuse/dirts were normally dumped for burning. At times particles from flames seep into the well. The schools toilets facilities are in bad shape and hand washing practices is almost non existent among students. What is your name and which class are you? My name is Zainab Mailafia Gusau. I am in JSS 3A. And I am the Ameerah (Head of the female Muslims students in the junior section of the school). What is yours reaction on the poor sanitary conditions that has enveloped the school? Lets me start by saying that healthy-hygiene orientation should be inculcated in either the curriculum or extra curricular activities in all the schools in the state because most houses in this part of the country are not health conscious. They don’t know it as a sin or an offence. Hence they say charity begins at home, so said the adage but the reverse is the case, let us then take charity from outside and bring it home for us to imbibe or copy. Most of the schools in the state are provided with inadequate toilets facilities. The available ones has been badly used or damaged by the students-user. No cleaner to wash or disinfect it. During weekly inspection days, the mistress incharge orders the students to clean up the place but after cleaning, the affected students will not properly hand-wash themselves. So they carry these infected hands to the kitchen to collect their morning breakfast. Are you saying that Government/School Authorities are responsible for these poor sanitary conditions? Of courses yes, as government can not do it all, lets them call corporate bodies viz banks and other companies in the state to observe their Corporate Social Responsibilities (CSR) by coming to the improvement of these poor sanitary conditions in these schools all over the state. Can you enumerate the measures to be use or adopted? – Let there be storage tanks in keeping water for students use. – Let them bring enough detergents i.e. Omo, Soaps for proper hand washing after toilet use. – Let them buys buckets – that is one bucket – one classroom with many cups for student consumptions. – Let the kitchen be far away from the public toilets to be constructed. – Let there be orientation/training for the kitchen staff on proper and good sanitary conditions when preparing food for the students. – Let them build adequate toilets with disinfecting equipment and cleaners and adequate water provisions. – Let them provide working ceiling fans in all the classrooms and remove the students from all racker buildings constructed by the Yarima’s administration. This is because it absorbs heat coupled with the severe heat period/season. Anytime the students takes bean cake called “Kosai” in Hausa or the day they take boiled egg as their breakfast, the entire classrooms are heavily polluted, most especially these rackers buildings classrooms, thus becoming entirely not conducive for learning and infections can easily emits in such environment. If these measures were strictly adhere to, the students will be disease free and will carry the much eluded charity that suppose to follow them from home back to their destination. The last time residents of Ewohimi town in Esan South East Local Government Area of Edo State, South south Nigeria, fetched potable water from the dispensing pumps installed in strategic locations across the community by the state-owned Water Board, was over a decade ago. Ewohimi, an ancient town with a population of over 25,000 people, is the largest town in Esan South East Local Government Area. Geographically, the town lies approximately 60 kilometers West of the River Niger from Asaba and about 200 kilometers South of the Niger from Lokoja axis. Interestingly, the community which is also second to Uromi in population and size amongst the entities that constitutes the area of the state popularly referred to as Esanland, once had a functional pipe-borne water scheme that was rated as one of best in the area in terms of efficiency, water quality and service delivery to the people. Unfortunately, the town’s golden era could not be sustained as water supply gradually plummeted till it went completely comatose. Consequently, relics of the facilities which visibly adorn the streets in their rusty and dilapidated forms, are all that is left for first-time visitors and the children born and raised in the community within the last ten years to relate to presently. Meanwhile, residents who were old enough and privileged to witness the development then, have never stopped relishing the experience nostalgically. They proudly tell whoever cares to listen about the ‘good old days’ but the reality today is that the people have all along, suffered the indignities resulting from relying on water from not too hygienic sources as alternative for their drinking and domestic uses since things fell apart. A cross section of the residents who spoke in an interview, disclosed that the public water supply has been grounded completely in Ewohimi since 1999 after functioning epileptically for some time. They however added that successive administrations in the state have made faint-hearted attempts to rehabilitate it but all to no avail. Worse still, there is presently no functional bore hole as an alternative source of water supply in the entire community. Against this backdrop, majority of the residents resort to drinking ill-treated sachet water popularly called ‘pure water’ or buy water in jerry cans and buckets from those who sell from cemented wells in their compounds while some go through the Herculean hassle of fetching clean water from pockets of rivers and streams located several miles away. While bearing her mind on the development, Mrs. Veronica Udo, a mother of six, lamented that the perennial scarcity of water in the community was causing additional economic hardship in most households, adding that an average family now spends between N500 to N1000 weekly on water for drinking and domestic uses. Also speaking in the same vein, Mr. Henry Itama, a resident who is retiree, observed that what they are going in Ewohimi can be likened to the proverbial ‘Paradise lost’ because quite unlike many communities in Esanland which never had the good fortune of assessing reliable supply of pipe-borne water, they never witnessed water problem until the system collapsed due to poor management by the authorities. Ewohimi, according to him, had the best well treated water in the 1970s, 1980s as well as the greater part of 1990s, adding that easy and regular assess to potable water inadvertently brought about healthy and hygienic living standard in the whole community. “It is very pathetic that we have retrogressed badly in this town. It is incredible that people now drink water from sources that are any thing but potable. Some of us cannot afford to even have a good bathe after a hard day’s job in the farm, especially during dry the season here”, he said. He also noted that the lack of potable water is taking its toll on the health of the residents, adding that water-related diseases have been on the increase lately in the community which, he said, also suffers from the absence of a well equipped primary health care centres. Lending credence to this, Rev. Patrick Ulinkhifun, an opinion leader and native of the town, said the protracted Ewohimi water project saga which has assumed a worrisome and nauseating dimension, particularly when viewed against the background of its adverse effect on the wellbeing of the residents, who, according to him, have been suffering in silence, over the years. Rev. Ulinkhifun observed that the indifference and apathy so far displayed by the authorities in charge of the project, has not only compounded the problem but makes it appear insurmountable in terms of what it will cost it to revamp it completely when all the facilities seems to have decayed beyond repair. “The problem looks mysterious to me because I can not comprehend why those who are supposed to fix it are idling away doing nothing about it. We need a miracle to turn things around here. God’s intervention seems to be the only way out of this problem”, he added. He also attributed the problem to bad leadership at both the local and state levels, adding that there is no where societal problems can be redressed when those in authority are corrupt, greedy, selfish, wicked and morally bankrupt. “The last time we saw sincere efforts to address the problem was when a prominent politician from Ewohimi, the late Hon. David Aimenbelomon served as caretaker chairman at the local government council. He tried to revive it but the water ran in some parts of the town for a while before it stopped and we lost it again till today”, he further disclosed. Corroborating this, Chief Robert Enoselease, a ranking palace chief, attributed the lingering problem of resuscitating the water supply in the community to what he described as the lackadaisical attitude and neglect on the part of government to redress the situation. Chief Enoselease, who is the Ihaza of Ewohimi kingdom, noted that the desired interventions from the government geared towards solving the problem over the years, have not been too encouraging in terms genuine and unflinching commitment to fix it and manage the facilities in a sustainable manner in the interest of the people. The Ihaza who represents Idumijie community at the palace of the Enogie of Ewohimi kingdom, His Royal Highness, Lord Peter Ogiefoh Usifoh II, also stated that residents of the community have been very desirous, supportive and committed to making it work efficiently and effectively. “At a point, residents had to task themselves through the collection of levies in order to collectively contribute funds for the purchase of gas to power the pumping plant here in the Water Board office for a period of about four years just to keep it running”, he stressed. He however expressed optimism that the present efforts by the Governor Adams Oshiomole’s administration to fast-track the rehabilitation of the Ewohimi Iyagun Water Supply Scheme may turn things around for good and put smile on the faces of the residents once again. “As you can see, the new contractor handling the project is presently digging up the old pipes and replacing them with plastic ones but let us keep our fingers crossed and hope for the best”, he further assured. Ekiti state: Open defecation in Governor’s office! Adesina Wahab, a correspondent with Compass Newspaper reports that the sanitary crises in Ado Ekiti, the capital town of Ekiti state, South west Nigeria has reached alarming trend. Most houses and offices do not have toilets and people urinate around the premises. Even in the Old Governor’s offices, along barracks Road, Ado-Ekiti, there are no toilets, and visitors have to walk across the road to defecate in the bush close to the Nigeria Union of Journalists secretariat or rush to a fast food joint located about a kilometre away. Poor sanitary conditions in some parts of Ekiti State, especially Ado-Ekiti, the state capital, is raising fear of a possible outbreak of water based diseases, investigations by our correspondent has revealed. It will be recalled that the Ekiti State Government recently reported cholera outbreak in two towns, namely Igbara-Odo in Ekiti South-West Local Government Area and Ikere-Ekiti in Ikere Local Government Area. The cholera outbreak in Igbara-Odo, according to the Ministry of Health, claimed two lives, while that of Ikere-Ekiti affected some people but left no casualty. When the epidemic broke out in the two communities, the Commissioner for Health, Prof. Sola Fasubaa, advised the people of the state to observe and imbibe sound hygienic habits. However, despite the call by the Commissioner, the situation in some areas in Ado-Ekiti is still pitiable as far as hygiene is concerned. In Atikankan, Irona, Okeyinmi and many areas of the state capital, people still defecate in open places. The storm water drainage in Atikankan area serves as the toilet, as most of the houses located there have no toilet facilities. At any time of the day, people (both young and old) could be seen defecating in the drainage or pouring human waste there, despite the closeness of houses and food sellers of different sorts. 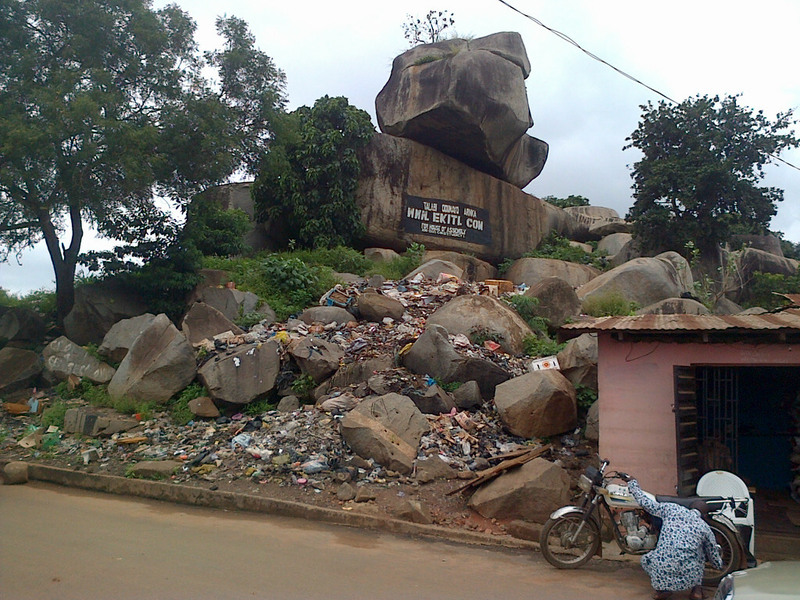 At Okeyinmi, the popular ‘Okuta n gbe okuta leri’ (rock) is serving as the toilet for hundreds of people leaving in the area, in spite of the fact that the rock is right in the centre of the town. Findings also show that most houses in Oke-Ila, Okesa, Ojumose and others do not have toilet facilities, leaving residents to dump wastes in streams and drainages. The situation is not different in most of the towns across the state and interestingly, some government offices are not better of, as they lack adequate toilet facilities. For instance, the Old Governor’s Office, Barracks Road, Ado-Ekiti has become an eyesore, as the compound is left unkempt, because the Governor and Deputy governor have moved to new sites. Some of the offices also do not have toilets and people urinate around the premises. 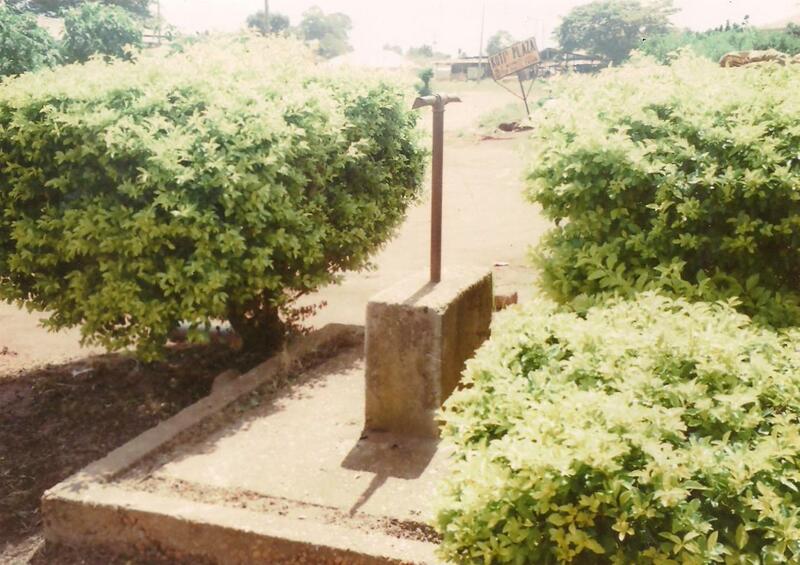 For a visitor to the Old Governor’s offices, defecating may require going to the bush close to the Nigeria Union of Journalists secretariat or rushing to a fast food joint located about a kilometre away. The indiscriminate dumping of refuse is also compounding the poor sanitary condition, as people are fond of dumping their refuse in gutters, and this always lead to blocked drains whenever it rains. The boss of the Ekiti State Waste Management Board, Mr. Adebayo Morakinyo, recently lamented the misuse of the waste bins placed in some places in the town. He told journalists at a forum that some people go as afar as dumping human waste in the bins. He also decried the poor response of people and even some corporate bodies to the use of bins put in their premises by private public participants in the waste management scheme of the state government. Some people are resisting paying the token the operators are charging on a monthly basis, preferring to dump their wastes in open spaces and gutters. The story is contributed by Adesina Wahab, and published under the pro poor WASH stories project implemented by the Water and Sanitation Media Network Nigeria, with the support of West Africa WASH Media Network, WaterAid, and Water Supply and Sanitation Collaborative Council. 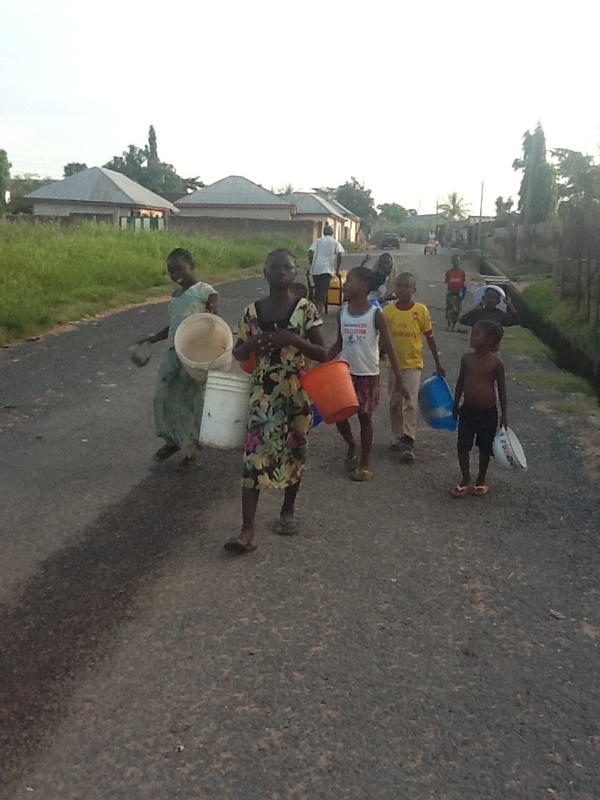 Residents of Jalingo, Taraba State capital in Northern Nigeria, are groaning over the unending scarcity of portable water, writes AYODELE SAMUEL, a blogger at www.ayodelenews.blogspot.com reports. “Water, they say is life”, and the human body constitute of 70% of this liquid substance, as such water tops the priority list of the demand of mankind. 80% of diseases plaguing humanity are due to use or consumption of unsafe water. It is generally believed that the accessibility of sufficient quantities of portable water and safe sanitation facilities to a household determines the quality of life of the people and potential for poverty alleviation. This leads to the welfare improvement and is generally linked to a decrease in infant and maternal mortality, increase nutritional values and environmental hygiene. 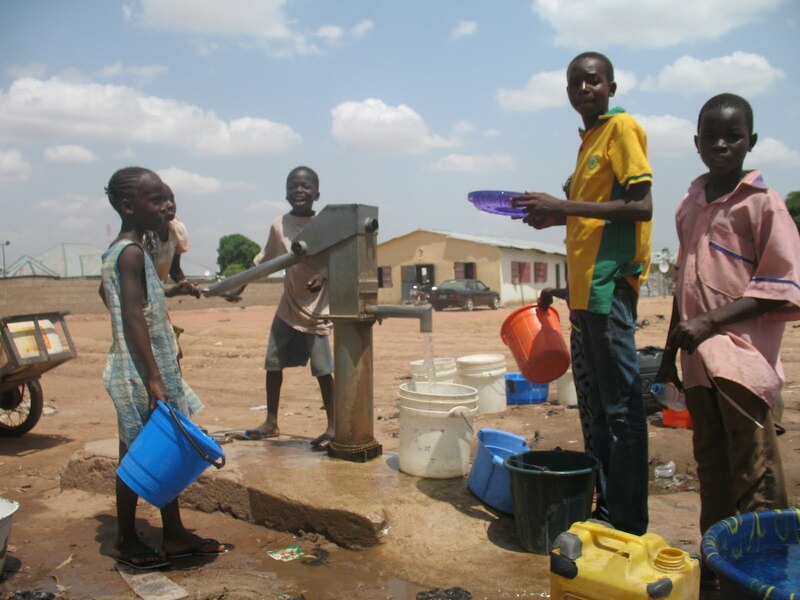 In Jalingo, accessing portable water by residents remains a major battle forcing residents of the city to rely on local vendor popularly called Mai ruwa and few streams for water, while public water supply remained exclusive for the rich in the state. In another slum community, Barade ward, there are tales of woes and anguish whenever the Lamorde River, the only source of water in the area, dries up, typically during dry season. When this occurs, residents of the community are left with no other option than to buy from ‘Mai Ruwa’ water vendors, whose source of water is unknown. In another community, Agangagwasa, a resident, , Julian Bala narrated that getting water for domestic use is a major challenge. She called on the government to show more concern to the untold suffering water scarcity has brought upon the people, by making provision for more boreholes and making sure that the taps are running again. The Ward head of Mayo-Gwoi Village, in peri urban Jalingo, Mr. Aliyu Jassa, said the lack of access to portable water in the city is harming their health. Hamman Yakubu a retired bank official, on his part lamented the hike in price of water by local vendors. “Me and my family consume not less than three trucks a day at N200 per a truck of ten jerry-cans each, but we are at the mercy of the water vendors, who sometimes hike the price of the water at will,” adding that it’s too expensive for an average citizen in the state who earns less than N18, 000 per month, considering other family expenses like sending the children to school. Mr. Yakubu also noted that though there are pipes laid down for distribution to homes, but too expensive to embark upon, as it will cost N60,000 for the installation per home; adding that the pipes have rusted due to non-usage resulting to health hazard for the few consumers. Other residents across the city bemoan the recurrent shortage of water andoverdependence for water supply on Mai ruwa whom sources of water is not known to the consumer. Danlami Musa a water vendor said, he sells as much as fifteen trucks a day and due to the high demand of the product he often have to go in search of water from the stream, stating that sometimes the water from the borehole is not sufficient to go round. Secretary of the Association of water vendors in Jalingo, Mr. Iliya Jacob who had been in the business for more than 14 years said his service is an alternative to government. “ I have been providing water for this entire area for 13 years, people troop in from distances to come here for water, sometimes we have to give them for free, as a humanitarian service, we see the untold hardship on our people, we regard our services as an alternative to the government, because most people cannot afford to buy trucks of water per day, there is no other option for getting portable water” he added. Some of the challenges facing the State Water Board according to investigation includes obsolete machines that needs renovation and replacements, inadequate funding , deficiency in human resource development, and manpower that has reduced from 600 to 324 since the creation of the state. Other challenges according to Mr. Mambur, is the need to upgrade the facilities for water distribution, stating that only six out of the fourteen boreholes in the Board are functional. Calling on the the government to subsidize water supply, in the state rather than putting more money in providing drugs, Mr Mambur said the proper funding of the Board and efficient supply of safe water will help prevent diseases. A government official who does not want his name in print confirmed that that the State Government recently accessed a loan from the African Development Bank, to enable it upgrade the water supply coverage in the state from 32% to 75% . The story is contributed by Ayodele Samuel, and published under the pro poor WASH stories project implemented by the Water and Sanitation Media Network Nigeria, with the support of West Africa WASH Media Network, WaterAid, and Water Supply and Sanitation Collaborative Council. France’s second largest city- Marseilles, coordinates 43° 17′ 47.04″ N, 5° 22′ 12, last month hosted two week long global meetings to discuss the challenges in the water and sanitation sector; specifically to identify management options that breeds inequity and crisis in water resource allocation and sanitation service delivery, and proffer solutions to prevent water related issues from causing a prophetic third world war. Officially, what was supposed to be held in Marseille between March 11th and 17th 2012, was the World Water Forum (WWF), the sixth. Previous WWFs were held in Morocco 1997, Netherlands 2000, Japan 2003, Mexico 2006, and Turkey 2009. The WWF is organised every three years by the World Water Council (WWC) which describes itself as a an international multi-stakeholder platform, established in 1996 “to promote awareness, build political commitment and trigger action on critical water issues at all levels, including the highest decision-making level, to facilitate the efficient conservation, protection, development, planning, management and use of water in all its dimensions on an environmentally sustainable basis for the benefit of all life on earth”. Climate change or the unfriendly activities of human beings on earth and the environment may be the result of acute shortage of clean and safe drinking water in Sierra Leone and other parts of the continent, causing millions of people including children and women suffer on a daily basis. The situation of acute shortage of clean water has been experienced in the city and the provincial areas where less concentration is normally given to communities on the part of water and other social basic amenities. 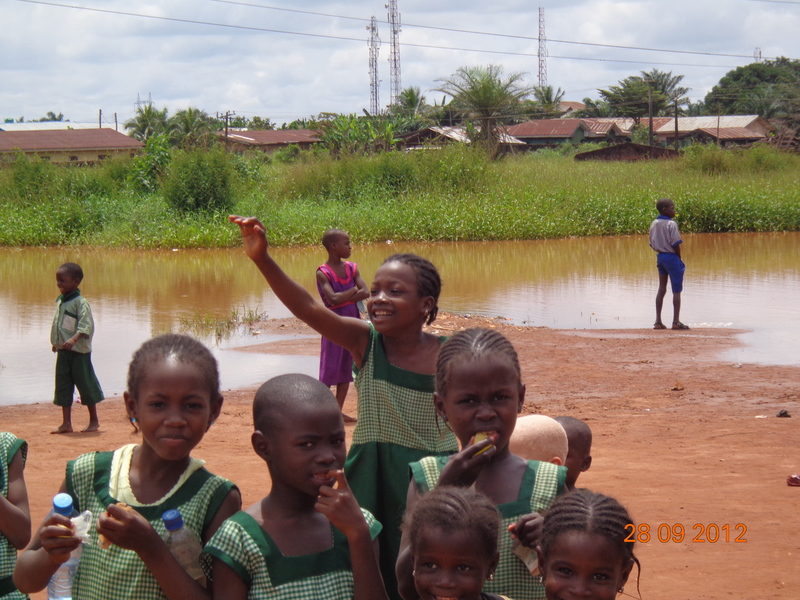 In Sierra Leone, the problem s of acute shortage of clean and safe drinking water are not only occurring in the deprived communities in the provinces but those communities in the outskirt of the city as well. Water is an essential commodity and the international community is putting more efforts to it to ensure human beings access safe and clean drinking water. On September 30th 2010, the UN Human Rights Council adopted by consensus Resolution 64/292 the human right to water and sanitation affirming that water and sanitation are human rights. During this historic meeting in Geneva, the UN affirmed by consensus that the right to water and sanitation is derived from the right to an adequate standard of living, which is contained in several international human rights treaties. Standard times environmental reporter, Ishmael Kindama Dumbuya travels to communities surrounding the capital city of Freetown and those in the Kambia District and get a first hand information on how the urban, rural and children are struggling to get safe and clean drinking water for their families. I first travel to Kambia District, a distance of about 150 miles. From Kambia Town, I proceed to rural communities in a village called 15 Mile in the Tonkoh Limba Chiefdom, exactly 15 miles distance from Kambia Town. The village stretches northwards of the chiefdom and it is about 3 miles from the beginning of the Chiefdom. Over 1000 people live here. There is no community center in this village in case there is a need for social activities or community meetings and gatherings. I spend a night in here and electricity is not something to think about in the village. When a vehicle passes through the village at night, children and adults normally glad when they see the brightness of the vehicle. Absolutely, there is no development here and parents who love their children to attend school send them to other villages like Mile 14 and Sella Kafta before they can get basic primary education. Like in other communities in the Tonkoh Limba Chiefdom and other parts of the country, there is no water borne pipes or dug water well in the village. The over one thousand people in this village (children, youths and women) must walk two and half miles to fetch water for their daily use. In the morning after a stressful night in a strange village, I proceeded to the community only source of water called Kamaworni with Madam Mabinty Kamara and a class nine year old school pupil. The water well of about 50 metres round is surrounded by trees and the water level is low and one must go very close to fetch a bucket of water and be careful not to fell into the well. In normal cases, clean and safe drinking water is usually colourless, but this is not the situation here in Kamaworni water site. The community drinking water is colorful and if you are a stranger, you will not have the audacity to take a bucket of water and wash your feet. But the community people who are used to this because of no alternative will do that and drink with confidence. The clayed water is a host to toads, snakes and other water animals. If you are not used to see these things, you will be scared seeing snakes, toads and other animals dancing and playing in the water while children and women trying to fetch buckets of water for the day’s use. I saw stinky mud which was producing unfavorable smell from the water. Mabinty Kamara who is married to a husband of this village and now 20 years since she came into the 15 Mile community said they have been facing with such situation of fetching filthy water for their homes. Madam Mabinty knows the water is filthy and not suitable for human beings to drink and do other domestic works. She said there is no alternative for them and “either we fetch clay water and allow it to sentiment for use or we do not get water for our homes at all costs”. The drinking of the filthy water normally result to sicknesses for the community people and Madam Mabinty said “we do normally sick and because the God almighty is with us, some of these sicknesses are cured by the clay water after persistent drinking”. Pa Ceray Sorie Kamara is one of the elders of the 15 Mile community. He also reflected on the past how they have been suffering from the village without clean and safe drinking water for themselves and their children. 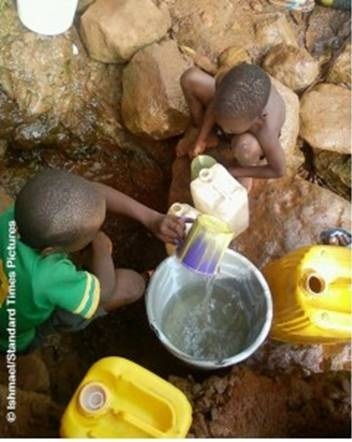 Pa Kamara said “we have been drinking this water for some time now and we are use to this. We will continue to use to the sad situation if there is no assistance from NGOs, the government of Sierra Leone or any philanthropist individual or institution”. Pa Sorie is not in favour of his community being left from development by NGOs and the government especially on development concerning water and sanitation. He said “the NGOs like Action Aid in the past ignore them and pass through their community to go and dig community dug-water well taps in other villages. Pa Sorie adds “they pass us here as if we don’t want water wells. I don’t know if it is because the village is small and even the fact is the village is small, we are still people who need basic needs and clean water”. After a stressful journey in 15 Mile Village in Kambia, I boarded a vehicle and back in Freetown for another assignment in the Tree Planting community in Leicester Road. The Tree Planting community is overlooking the capital city of Freetown. Madam Adama Fatima in the Tree Planting community in Freetown shares the same experience with Madam Mabinty Kamara who lives in the 15 Mile village. The Leicester Road community closer to the Western Area Peninsular Forest is also suffering from acute shortage of water. The watersheds which are the main sources for supplying water to the community and other parts of the city are dry-off because of massive cutting down of trees for settlement. About two years ago, the National Commission for Social Action (NaCSA) dished out funds over one hundred and fifty thousand Leones for community gravity water taps but these proposed taps never worked for the community. Probably, some of the community elders shared the money among themselves leaving a host of residents to continue struggling for the clean and safe drinking water. Although there are no known plans set by Non-Governmental Organizations and possibly the government of Sierra Leone to undertake pipe-borne or dug water taps in various parts of the communities overlooking the city and the provincial communities, the Minister of Energy and Water Resources while planting trees recently at the Moku Hills in the Western Area Peninsular Forests Reserve said they recognize that people are suffering to get clean and safe drinking water. The Minister said as a responsible government, they will ensure they provide water for people in the country. The only time the communities both in the provinces and some parts of the city can make use of clean and safe drinking water is during the mid of the raining season and if this situation is not corrected and assistance provided, communities in the provinces especially 15 Mile will continue to suffer and struggle to get clean and safe drinking water for their various uses. Le Réseau des Journalistes Ouest Africains sur l’eau et l’assainissement (WASH-JN) est un réseau régional de journalistes couvrant les questions d’approvisionnement en eau et l’assainissement pour les divers médias de masse de l’Ouest 13 pays africains, le Bénin, le Burkina Faso, Cameroun, Côte d’Ivoire, le Ghana, Guinée, Libéria, Mali, Niger, Nigéria, Sénégal, Sierra Leone et le Togo. Son objectif stratégique est d’augmenter la production de reportages convaincants sur l’approvisionnement en eau, assainissement et hygiène (WASH) se concentrant en particulier sur les perspectives des populations pauvres afin de parvenir à une attention accrue de tous les citoyens et les décideurs sur ces questions. Vers l’accomplissement de cet objectif, le WASH-JN invite les journalistes à soumettre des reportages convaincants portant sur WASH pour publication sur le blog du WASH-JN-www.wash jn.net. Des honoraires seront payés pour les meilleurs reportages qui seront publiés sur le blog. 1. Les reportages peuvent être au format texte, vidéo, photographique ou audio. 2. Les auteurs des reportages doivent s’inscrire sur le blog www.wash-jn.net pour soumettre leur production pour publication. Vous pouvez également visiter le site https://washjournalists.wordpress.com/wp-login.php et vous connecter en utilisant “washjn” comme nom d’utilisateur et “CEDEAO” comme mot de passe. 3. Une fois connecté, cliquez sur “Add New” sous “Post”, et soumettez vos reportages. Pour matériel audio et vidéo, vous pouvez soumettre l’URL sous lequel il a été publié. 4. Le nom complet de l’auteur et son adresse électronique doit être clairement inclus dans tous les reportages soumis. 7. Les reportages doivent avoir été édités et peuvent avoir déjà été publiés. Cette catégorie concerne les reportages qui mettent en lumière les questions WASH général, y compris l’accès, l’équité et l’inclusion, la transparence, l’égalité des sexes, mécanisme de financement, et la bonne gouvernance. Les travaux qui concernent les groupes marginalisés, les plus vulnérables et les populations urbaines pauvres dans les bidonvilles dans toute l’Afrique occidentale seront très bien accueillis. Peuvent participer pour cette catégorie des reportages qui mettent en valeur et font la promotion de la transparence, la responsabilisation et la bonne gouvernance dans le secteur WASH.
Cette catégorie est soutenue par Water Integrity Network (WIN). 11. La décision du jury est définitive et ses membres peuvent choisir un nombre illimité d’entrées, donc de gagnants par semaine. 12. En outre, l’auteur du reportage qui sera jugé le meilleur dans la catégorie « WASH Pro-pauvres » au mois de Janvier 2012 sera parrainé pour assister à la 6ème Forum Mondial de l’Eau en France en Mars 2012. Le soutien financier pour ce parrainage est assuré par le Water Aid en Afrique occidentale pour l’approvisionnement en eau et l’assainissement. 13.Ceci est également une invitation pour les journalistes à soumettre des articles pour le Prix des médias WASH, http://www.wsscc.org/media/wash-media-awards/2011-2012, les gagnants seront parrainés pour participer à la Semaine Mondiale de l’Eau à Stockholm. La facture est salée et les résultats de l’étude documentaire faite par le Programme eau et assainissement(WSC), un partenariat multi-bailleurs administré par la Banque Mondiale pour aider les pauvres à obtenir un accès sûr et durable aux services d’eau et d’assainissement, sont accablants. Il y a urgence. Ce n’est pas une imagination. C’est bien une réalité. Le Bénin perd 52 milliards de francs CFA chaque année à cause d’un mauvais assainissement. Ce qui équivaut à 1,5% du PIB national. La raison, même si elle est surprenante est toute simple. A ce jour, 2,5 millions de Béninois utilisent des latrines insalubres ou partagées et 5,2 millions de Béninois n’ont pas de latrines du tout et font leurs besoins en plein air. Des chiffres qui paraissent irréalistes à première vue mais qui sont bien vrais. Parce que selon les statistiques nationales notamment, les chiffres de la revue 2010 des secteurs de l’eau et de l’assainissement, seulement 44,4% des ménages ont accès à un assainissement adéquat au plan national. Ainsi, plus de la moitié des Béninois pratiquent la défécation à l’air ou partagent des latrines avec les autres.